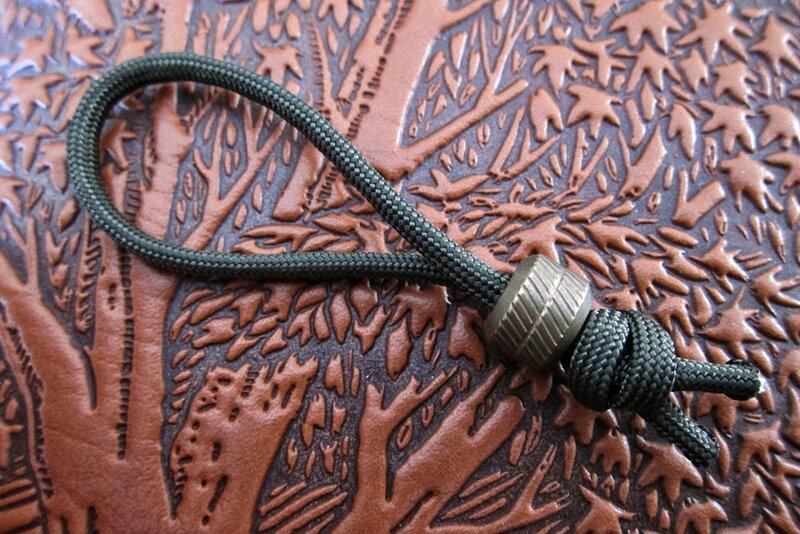 Today I have some Bronze Lanslide beads with rifle knurling. I have given these a deep patina followed by an aging and antiquing process. The OD green cord goes very well with them I think and they will look great on a jacket or tool. This is it on the bronze Lanslides, at least for the time being...They are the usual $15 each plus shipping and the link is below, thanks! All gone for tonight, thank you! Thanks for bearing with me this past week. I just finished grinding some more Poltergeist tools and E115s. These will go out to heat treat in the morning and will be back in about two weeks. In the meantime, I expect to see the previous batch of Poltergeists and mini Poltergeists to be back from heat treat sometime next week. I've been trying to get a lot of stuff going this past week or so with the idea of preparing for a fairly steady stream of sales throughout April and into May. 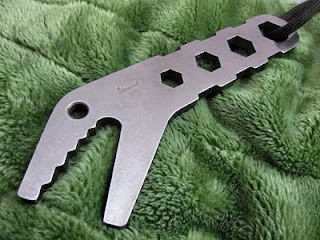 Today I have the rest of the Croc Wrenches done. These are the raw bar ones and there's only a handful of them available. So it will be one per customer sale and they are $70 each plus shipping, link is below. Thanks for stopping by! People keep asking me for XL bends and so I thought I better explain it here rather than keep on telling one person after another what the problem is. In my current designs with thumb scallops and hex cutout shapes it is not possible to do XL bends. Oh, I can do it, it's just that I end up having to fix half of them. The problem comes in anytime you have an edge that is not perfectly straight and one that has not been completely deburred and rounded over. What happens is, you get tiny stress cracks forming inside these edge features. 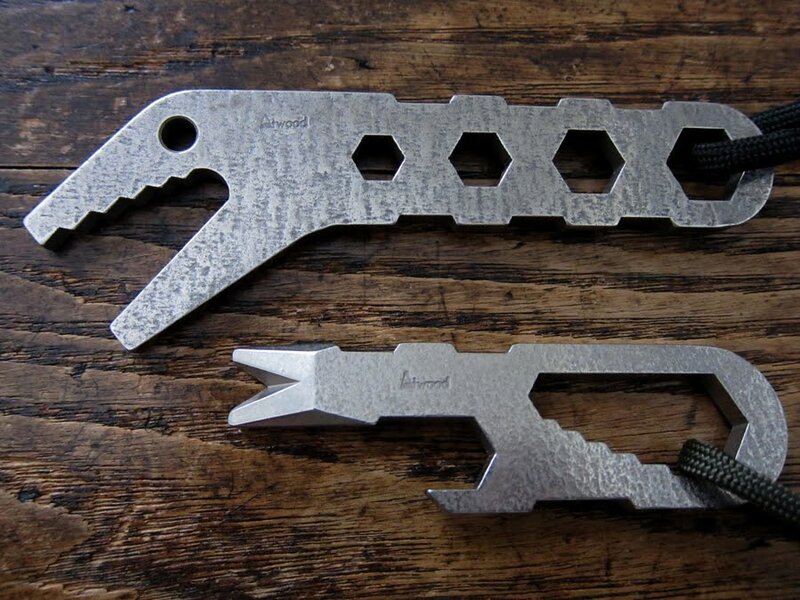 They probably aren't a big deal in normal use and would not break but they look unsightly to anyone who is studying the piece and so they undermine confidence in the integrity of the tool. At least, that's my feeling when I look at them. 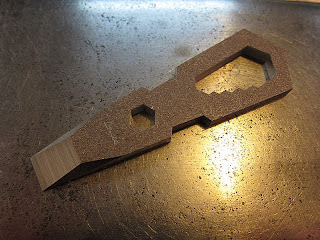 So, in order to make XL bends in any of my tools, I would have to go back to the original boring straight shapes which, to be honest, I have made tons of them over the years and I'd like to keep moving on with my current designs. Plus, they require an extensive tumbling BEFORE I make the bends because the sharp edge of a freshly sanded bar of steel is also susceptible to these tiny cracks. You need rounded corners to avoid the problem. My currently production flow does not include a pre tumble and so that would add another step and two weeks more time to get it done. So that's why I haven't been making anything with XL bends in a while. ;) Who knows though, maybe I will get around to it at some point...I am planning to revisit some older designs this year like I did last year with the mini Prybabies and Perfbabies, just haven't decided which tools yet. Here's a sneak peak at an unfinish raw bar E115 before it goes to heat treat. A neat little tool, it is similar to an Atwrench but more slender and without a bottle opener. I'm still waiting on surface grinding to be finished for the rest of the batch before I send them out but I'm hoping to get these out for heat treat by the weekend. Just wanted to let you know that I'm not resting on my laurels. I just got a big batch of Poltergeists and mini Poltergeists ready to send out to heat treat so those will be back in about two weeks. In the meantime I'm also getting a batch of G5 Prybabies ready for milling and will try to get those out to heat treat in a week or two. Once I get some of this sanding and grinding work out of the way I'll return to the Gear Leashes in both Delrin and titanium. Please stay tuned, there's a ton of stuff on the way! First of all, my sympathies for our Japanese friends. Our thoughts and prayers are with you! Sold out for now, but MANY more on the way over the next days and weeks. Thank you! 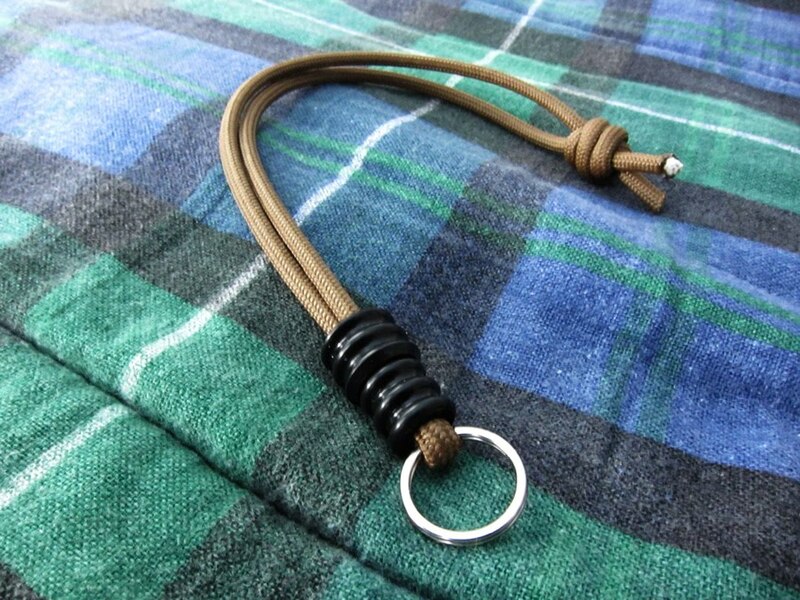 What's a LifeLine Gear Leash? Howdy folks! I've been working on assembling the new LifeLine Gear Leashes over the past few days. I'll be dribbling these out over the next few weeks as time and my fingers permit. The Gear Leash concept is a simple one. 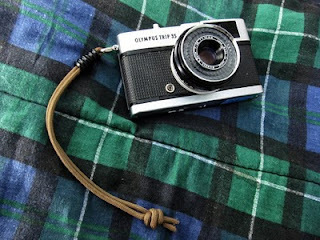 I've wanted a sturdy wrist strap solution for some time and I've been frustrated for years with the garbage straps with the "dental floss" attachments that I so often see. 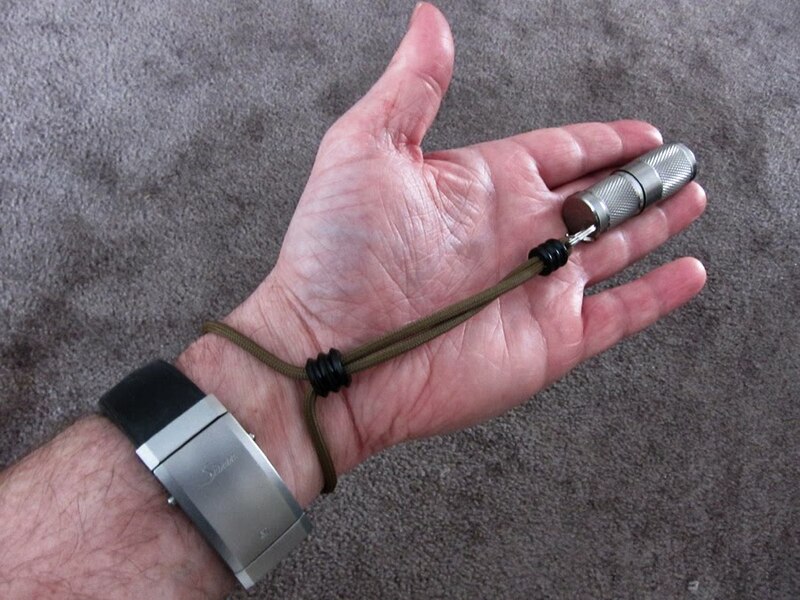 Very few wrist straps are the right size, are user adjustable or have a tension slider on them. 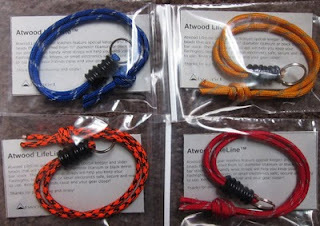 At first I wanted a material for these that was not paracord but the more I looked into it I decided that paracord really was the best solution particularly since I wanted to use round turned beads for the keeper and tension slider. Leather or flat nylon would be hard to thread through the beads and would not perform correctly. I did quite a few tests using my existing Lanslide beads and various pieces of EDC gear until I worked out the best set up. I wanted to make some all new bead designs for this project and I wanted the design in keeping with my past designs. So I borrowed the ribbed shape from the whistles for the slider bead and then scaled it down with a smaller inside diameter for the keeper bead. I did consider using Berkeley Point clips on these but decided a simple small keyring would be better. While I do like the BP clips, they have a nasty habit of coming undone if they get twisted in the pocket. 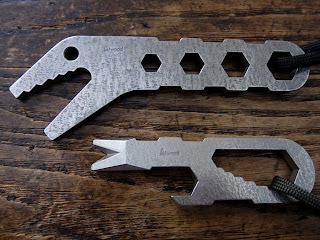 I have lost too many flashlights and pocket knives because of this, plus they are quite expensive even buying in bulk. 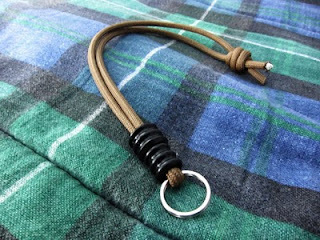 If you want a BP clip then throw one on the keyring of the Leash or retie the Gear Leash with a clip instead of the keyring. Speaking of tying, the knot on these is the same as the standard Matthew Walker knot that I have been using for years. The difference is, the MW knot calls for bringing the ends through the loops two times. On these, you simply bring the ends around through the loops one more time for a total of three. That's it, very simple to do and it results in a larger knot. 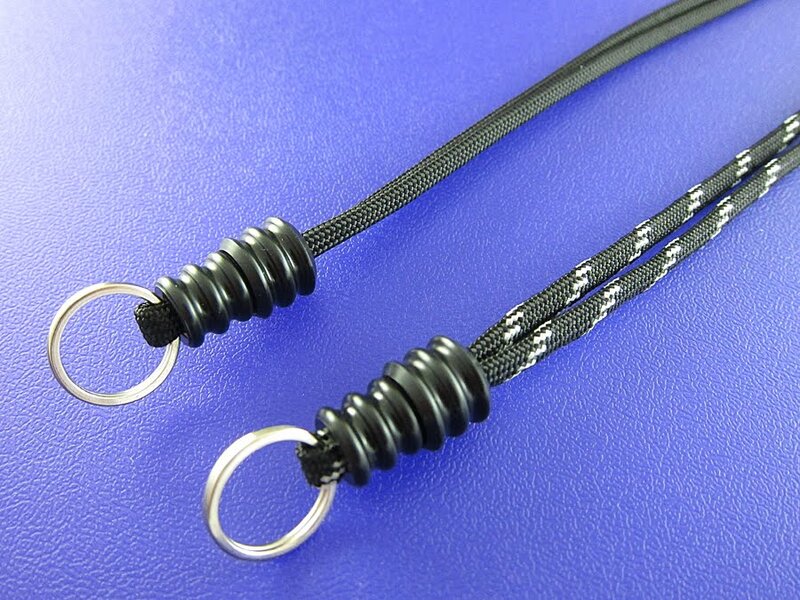 In this way if you want a shorter leash it is easy to retie it or if you want to change an old dirty cord for some clean cord or you want a different cord color it is easy to do. Simple instructions for tying the Matthew Walker Two Strand Knot are Here. For the first batch of these I chose black Delrin as the bead material. The reason for this is that I wanted to make some LifeLines that would be nonmarring. As many of you know, I am an avid photographer and I have many old cameras. I wanted some beads that would not scratch up the finish on those older cameras or other delicate items. Also, the black just looks so nice on the cord! I do have titanium beads running right now though and will offer the LifeLines with both satin finish and anodized titanium beads as time goes on. Sorry for the slow pace of things lately but I've been giving my left hand some time off for my tendonitis and it has helped greatly. I'm taking it a little easy and am really feeling much better. But that doesn't mean that things have stopped here, far from it in fact. I'm pushing forward with numerous projects and making some good headway. Early next week I will be sending a big batch of tools off to heat treat, Poltergeists and mini Poltergeists. The mini Poltergeist is exactly the same profile and size as the Ghosts that I did last year but it has a single hex opening in the top end. I had made just three proto ones last year that I called the Cyclops but I think mini Poltergeist is a better name since they so closely resemble their big brother. The first wave of those will be steel and a second wave is also cut and ready to start the grinding work. A third wave for middle or end of April timeframe will be in titanium. There will also be some ti Poltergeists around that time. I'm currently getting underway on the LifeLine Gear Leash project. The first of those will be in non marring black delrin. I will have pictures very very soon as I am tying the first ones of those this weekend. I'm making tons of them so no worries on snagging some. Second wave will be starting end of next week and those will be in titanium. I'll take pics and explain the philosophy behind the design in the next day or so. Stonewashed are sold out, thank you!